Most things are not always set in stone, and for that you just have to be flexible and go with the flow. Earlier tonight we received a call from our pilot that has flown us the past few times and he wanted to go over flight times. He said the admin had written Wednesday on the papers and he wanted to let me know that he had no way of doing Wednesday because he had prior engagements that he had to do that day. He said that he could do Tuesday afternoon if we were able to leave at that time. Of course we needed the flight, so we will be leaving tomorrow instead. We have lots of thing that need to get done prior to leaving tomorrow, but I think we will get everything done and be alright to go. We must admit, our anxiety this go round is much more than we thought it would be due to the upcoming scans. We really thought we wouldn't be, but we really want to see clean scans much like what we saw here at VCU, and that is why the anxiety is so high. Tomorrow also starts a new journey, my oldest, my 10 year old almost 11 year old is starting 5th grade. I can't believe she is starting 5th grade. Jessie, I am sorry I won't be there tomorrow on your first day of 5th grade, but I hope that you have a great day and I look forward to hearing how your first day went. Had we not had this journey that we are on right now, Emily would be starting kindergarden tomorrow. Its still hard to believe that we are saying kindergarden. We are still in awe that she is 5 and starting kindergarden. I know she is excited though and she deserves to be excited. Just wanted to give you guys a quick update. Remember to hug and kiss your kids and tell them how much you love them. Today is day 3 of spreading the awareness... Did you know? 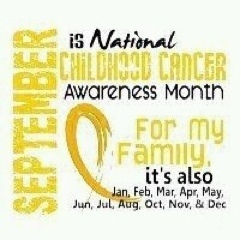 Cancer is the leading cause of death by disease in children under the age of 15 in the United States. We had clinic all five days last week and I am always happy to see Emily and her big beautiful smile when we are there :) We are holding our breath with you hoping that the scans will be reveal the same clean results as the ones at VCU! Safe Travels! Quick changes when you have a family can be tough. Praying you through all of this. Praying and praying for clean scans! !